Rebel fighters of al-Jabha al-Shamiya (Levant Front) warm themselves around a fire near the justice palace in the old city of Aleppo, Syria, Jan. 28, 2016. 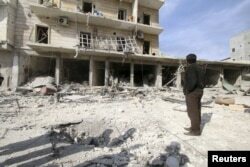 Syrian rebels in northern Syria have come under an intense weeklong bombing campaign by Russian warplanes. The insurgents, who also have been trying to hold on in the face of a coordinated ground offensive by forces loyal to President Bashar al-Assad, have sheltered in tunnels or taken cover in blast craters. One young rebel fighter told VOA about his ordeal and why he and many other fighters are withdrawing from the front. For almost a quarter of his young life, 20-year-old Ahmad has been a fighter, but the fight has gone out of him. After enduring 400 airstrikes in four days in the villages of the northern countryside of Aleppo, where a devastating Syrian government offensive has been pressed, he withdrew from the frontline along with a hundred of his comrades. He said morale has dropped to rock bottom and militia commanders are trying to boost the confidence of the fighters. There is talk of forming a new Aleppo army, uniting the more moderate, less religious-based militias aligned to the Western-backed Free Syrian Army. FILE - People inspect the damage after airstrikes by pro-Syrian government forces in the rebel held al-Sakhour neighbourhood of Aleppo, Syria, Feb. 5, 2016. When the warplanes paused their bombing runs, there were skirmishes with combatants clashing just meters from each other. “The first day, the fight, it is easy. After that the second days and the third, it was very difficult. We lost a lot of people, a lot of friends, a lot of fighters,” he said. And the fourth day? The Russian warplanes razed everything in a three kilometer area. He told VOA that on the fourth day he was at the front, in a chain of villages north of the city of Aleppo, there were more than 400 airstrikes. He said the fighters and civilians alike hid in tunnels dug before the offensive and in bomb craters. He said they could feel and hear the percussion of blasts. And the heat as well. At one point he said they examined themselves quickly to make sure they had not been hit. Everything was being thrown at them — missiles, barrel bombs and sea mines, as well as vacuum and cluster bombs. He said they became expert at distinguishing from the impact what had been fired at them. A short young man, with dark eyes and black hair, he hardly has the need to shave yet. He flicks a cigarette nervously as we talk. When I ask him why he left on the fourth day, he goes quiet. There is a long pause. He said that he and about another 100 fighters from the militia Nour al-Din al-Zenki withdrew not because of fear but because they felt they had been betrayed, let down by everybody who claimed to be the friends of Syria, meaning the U.S., the West and Gulf countries, as well as their own commanders. He said the commanders of the Free Syrian Army militias and the hardline Islamist brigades, as well as al-Qaida’s affiliate Jabhat al-Nusra, should have set their differences aside and unified. Now it may be too late.